located in the heart of Kansasville. Cast members include Floyd the barber, Otis and Barney. Sadly the wisdom and calm demeanor of Andy is missing from this years special players cast. For over twenty years the Kansasville town house Entertainment District has been putting on a monthly nightly show, usually starting at 7 pm and ending??? If you aren't entertained, then you need to go get a life ! Labels: Mario Lena, Mike Shenkenberg, Sam Stratton, Town of Dover Entertainment District, Town of Dover Wi. In the quaint Kingdom of Dover Wi. Drama kings and queens are at it again. The kingdom of Dover has lots of legally aged adults who for unknown reasons haven't mentally matured. Overactive and hypersensitive temperaments flare like fifth graders warring over nerf balls. Every few years the drama kings and queens have to act up and engage in WoW (Wars of Words). That is how it often works. Just like Super Mario Brothers! One election working with each other, next election knocking each other out of the game. The pettiness of politics transcends geopolitical boundaries to the Union Grove area as well, where children are indoctrinated into believing that government is only good and without fault. Where the only lessons the school teaches are OBEY! OBEY!! OBEY!!! Act up and you are facing the Racine County Sheriff Department, followed by jail. A school system where math,science and geography are no longer important. But they will teach the kids how be be properly indoctrinated, follow orders and accept authority and rule. A taste of political reality is just what children are in need of. Mandatory reading is no longer part of the school curriculum. Reading "The Good Earth", "1984", and "Catch 22" will not be part of an indoctrinated student. And what about our worthless press? The local Racine Journal Times has yet to take on head to head the Foxconn eminent domain fiasco that is currently in full swing. We have government officials who are violating their oath of office as they misuse eminent domain proceedings against landowners to acquire land for a foreign corporation. Government corruption is real and prevalent, so the more we speak and act about it, the better we can address it. We all know current chairman Mario Lena was not elected to be a Politician or Statesman. nor does he pretend to be. Truth being known, I'm not sure he is smarter than a box of rocks. Even a box of rocks knows when to remain silent and when to make noise. Mario campaigned on the promise that town of Dover funds would be better allocated back to serve the residents of Dover, not to fund parasitic engineering and law firms who siphons funds from road and public utility projects. Lena's plan must be working, at the last town hall meeting, road repair crews stated a records amount of material was used to repair town roads ( or did he say historical) matters not. To see childish behavior makes me wonder what event stymied so many adults from mentality maturing. These adults appear educated, but failed to learn how to prioritize life's twists and turns. Perhaps some of the pettiness, hypersensitivity and childish behavior may be attributed to petty conversations, jealousy, dementia or alzheimer's. Must make people brain dead when they drink the water! Quit Drinking the green Eagle Lake water - Stupids! Any and all funds related to Natures Bend Road! 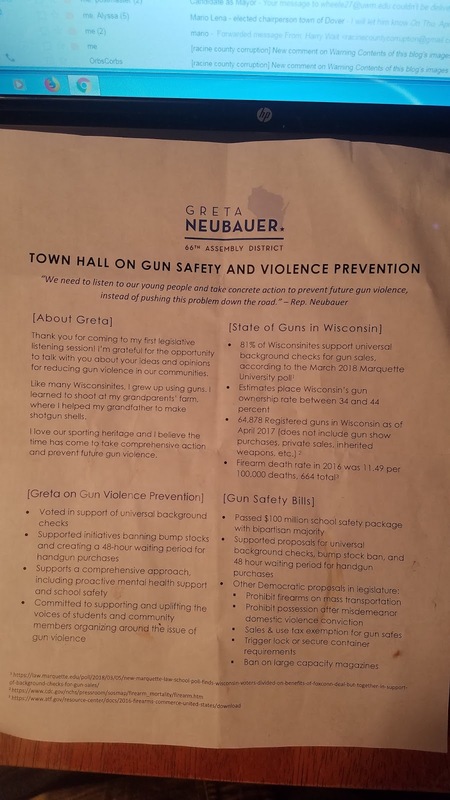 On March 25th 2018, a Town Hall meeting on gun safety and violence prevention was hosted by State Assembly Representative Greta Neubauer. Preceding this town hall meeting, Rep. Neubauer wrote an editorial in the Racine Journal Times of her concerns of gun lobbies and the NRA. Ms. Neubauer held the listening session for the general public to share their concerns and ideas. To the credit of Ms. Neubauer, the March 25 town hall meeting was a true listening session where the public had their opportunity to present their concerns of gun safety, violence and fear of law enforcement. Check out the third subtitle; [State of Guns in Wisconsin] 3rd. bullet point in column. Whoaaaaaaa……., according to Ms. Neubauer’s flyer, Wisconsin has 64,878 registered guns as of April 2017, referencing a source that does not appear to support her claims. Gun Registration in Wisconsin? Is this data deep state trickery ? or perhaps did Rep. Neubauer stumble upon some Wisconsin secret data banks, revealing hidden data that has been kept from the public? Whatever the real story is, we are going to kick Pandora’s Box until the truth is told. can safely estimate more than three million guns exist in Wisconsin citizens hands. In Wisconsin, it appears we have a free standing 2 million plus armed Militia exercising their 2nd. amendment rights. Two to Three million guns vs. 64,878 guns ? Think about this, every day over two million cheeseheads safely go about their business without causing an incident or ruckus with their guns. Only by knowing and understanding real numbers can we focus where our efforts to thwart gun violence will be best served. Do you believe the Deep State numbers or research from credible sources?